The U.S. wind energy industry released their annual report last week touting another record year. More than 10,000 MW of new wind power generating capacity came online last year, the largest year in U.S. history, and enough to power the equivalent of 2.4 million homes or generate as much electricity as three large nuclear power plants. America’s wind power fleet will conserve approximately 20 billion gallons of water annually that would otherwise be lost to evaporation from steam of cooling in conventional power plants. And, it will eliminate greenhouse gas emissions, equivalent to taking 10.5 million cars off the road. In state rankings, Iowa leads in terms of percentage of electricity from wind power, getting 14% of its power from the wind, and also leads in highest number of jobs in the manufacturing sector. 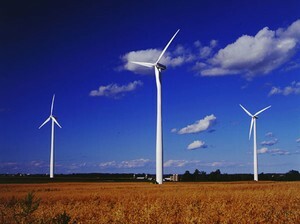 Texas consolidated its lead in wind capacity and in largest wind farms installed. Despite the economic downturn, the demand for small wind systems for residential and small business use (rated capacity of 100 kW or less) grew 15% in 2009, adding 20 MW of generating capacity to the nation. Seven small wind turbine manufacturing facilities were opened, announced or expanded in 2009. All 50 states have jobs in the wind industry, with 85,000 people employed. Ten new wind turbine manufacturing facilities came online in the U.S. last year, 20 were announced, and nine facilities were expanded. 100 companies to manufacture wind components opened, announced or expanded in the past three years (2007- 2009), bringing the total to over 200. For the unemployed person looking to join the burgeoning field, 205 educational programs now offer a certificate, degree, or coursework related to wind energy, mostly offered by community colleges or technical school programs. Yes Yes yes! Thanks Geri!